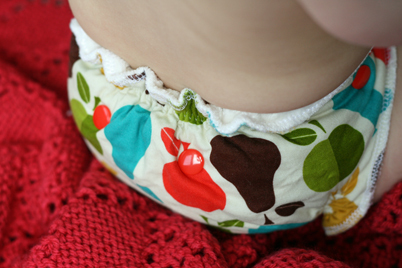 I'm very excited to be returning from our family's summer vacation to present you with one of the cutest, most summery diapers out there--just in time for the heat of July! 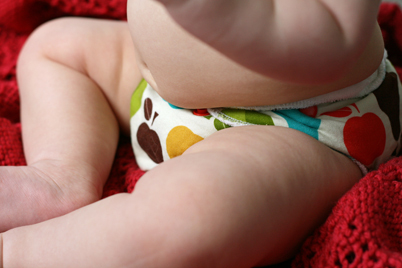 In continuing with our natural fibres theme for the summer, I am thrilled to introduce a terrific mama-made fitted diaper business, Cheeky Cloth! Run by mama Shannon from the Great Northwest, this home-grown diaper shop stocks some of the cutest fluff I've ever seen! Apart from sweet fitted diapers, Shannon also periodically stocks nursing covers, soakers, and whatever else might grace the top of her sewing table when inspiration strikes! 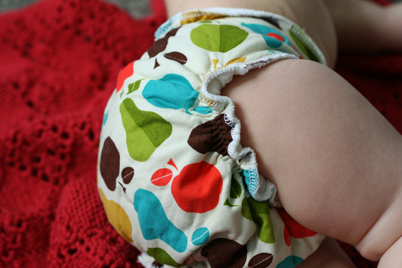 Up for review, Shannon sent me her one-size fitted cloth diaper in the super cute "Orchard" print. I love the unique cotton fabrics that Shannon uses to cover her diapers--they are definitely some of the cutest I've ever seen, and they are sweet enough to wear in the open air, pantless, or under a dress or skirt--perfect for the hot summer weather! As with all the other fitteds I've been trying, this fitted was very soft and breathable, preventing humidity and rashiness in the diaper area. As with all fitteds, you have to remember that although they are absorbant, they are not waterproof, so a cover is still needed for long periods of wear & tear. 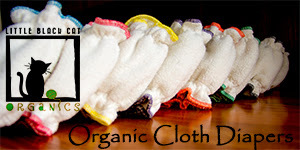 I love the inner lining of these diapers, made with OBV (organic bamboo velour). I've sampled this fabric before on some cloth wipes I've tried and was so excited to finally receive this fabric in a diaper. Even after many washes and dries, it stays so buttery soft. The whole diaper is lined with this velour, and a snap-in soaker pad is also constructed of the same. The great thing about bamboo, of course, is that it is even more absorbant than cotton, but does not add extra bulk to achieve this level of absorbancy. I love that this diaper had a good amount of waist snaps (with cross-over capabilities) in cute, punchy colors (mine came in a vibrant orange color). The only downside I found to these snaps is that when the diaper is snapped to a larger size on a chubby tummy, the snaps that are undone can dig into the hipbone and leave a mark on your baby. I mentioned this to Shannon with the idea of adding hip snap covers (I know other brands sometimes offer these), and she said this is a great suggestion and will be looking into it. The digging in did not bother me for daytime and playtime, but for my side sleeper, I didn't ever have her wear this diaper for napping or bedtime for that reason. However, with a cover overtop, I have no doubt that this diaper would have the ability to just absorb and absorb and absorb, even all through the night. 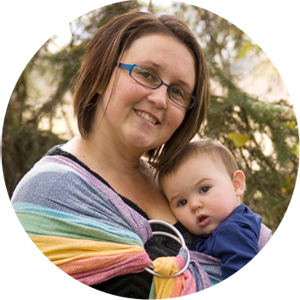 In addition to the waist snaps, and to allow for one-size fitting, there are also rise snaps to adjust to your baby's size, whether small, medium, or large. Overall, this is a sweet, cute fitted diaper just perfect for summertime wear especially. Other than the hip snap concern, my only other complaint is that it does fit a little small and so we won't be able to enjoy it quite as long as some of the larger PUL pocket diapers I have (I don't think it will last much more than 25-30 lbs on a chubby baby); however, on the flip side, this diaper would be far more effective in fitting a newborn than most brand-name pockets. Head over to the Cheeky Cloth Etsy shop right now and pick out your own too-cute fitted diaper for only $19.50. 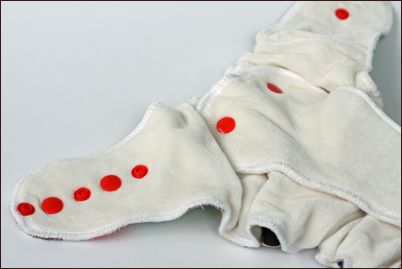 Cheeky Cloth is also offering one lucky winner a set of 4 of their super soft organic bamboo velour soakers! Make a purchase from the Cheeky Cloth Etsy shop and allow yourself one extra entry per item purchased! Final details: I received no financial compensation for this review or giveaway, though I did receive the sample items free of charge. All opinions shared are my own, and I was not persuaded to share anything other than my own thoughts. Other users may have different experiences with this product than what I have shared. This giveaway will end on July 20, 2011 at 11:59pm MST and is open to residents of Canada and the USA only. Winner will be chosen randomly using random.org’s services. The winner will be contacted by email and will have 48 hours to reply before a new winner is chosen. The prize will be supplied and mailed out to the winner by the sponsor of this giveaway. "hearted" cheeky cloth on etsy as "kaylaburd"
I saw "little republican" and know my hubby would love that one - my fave too! I love the Road Trip print!! I followed via Google follower! I love the owl print @Cheeky Cloth! I added the Cheeky Cloth shop to my Etsy favorites! Im a follower if @CDContests! Made a vote on Picket Fence! Cheeky Cloth One Size Organic Bamboo Fitted Diaper "Whale Tale"
I love the Bombs away airplane print! 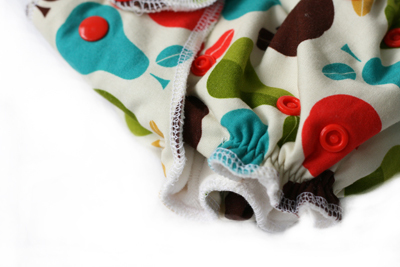 I like the Cheeky Cloth One Size Organic Bamboo Fitted Diaper "Bombs Away" from the Clothislove etsy store. I heart Cheeky Cloth on Etsy via GreenHouseBoutique. 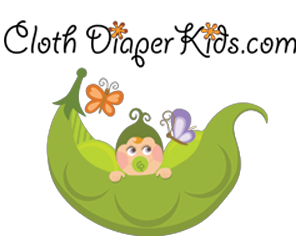 I like Cloth Diaper Contests & Giveaways on FB via Jordyn Lessenberry. I like Cheeky Cloth on FB via Jordyn Lessenberry. I follow @CDcontests on Twitter via morningcupofjo. I subscribe to your email updates via thelessenberry@gmail.com. I love the bombs away diaper! the "alice" print is my favorite!!! I really like the orchard or the pretty paisley prints! I added Cheeky Cloth to my favourites on Etsy. My username is northerntraveler. I like the Owls on a branch diaper it's so cute. Favorite print is "little butterfly"
I follow via GFC as Samantha. "Whale Tale" is my favorite diaper print.